Cost ranges and inquiry form for the upright root tables, below. 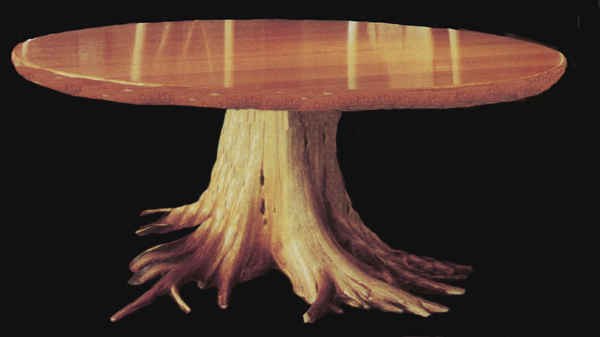 An upright root stump table base, similar to the above table, is characterized by it's extending roots, undulating, beautiful, and natural. 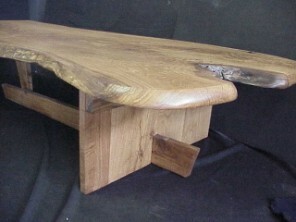 The table top may be of figured oak wood, stone, or burl woods. Symmetry of roots to provide an all round solid base, individual root extensions for a " tree" look similar to above table, and the interior wood structure of the rootball must be solid, in order to provide time enduring long life and solid support for fasteners of top. Certainly not all root balls fit the requirements. Root balls exist in a variety of sizes. Some applications, such as long rectangular tables, may require the use of two root bases and smaller tables will require the trimming of some roots. The photo above was an 8 foot diameter table. This diameter allows use of even longer roots. Costs - Coffee tables range from $2,900 to $5,600. Dining tables start at about $4,400 with a seamed, figured, oak top. Burl, and natural stone tops add: $900 to $1,500. Onyx stone by special request. A few once piece ( 1,000 year old burl tops available ). Call for pricing. You may request a cost quotation for a specific size and type of table using the form, below. We'll get right back with you with cost estimates and current availability. I generally try to keep one or two of these pieces in the seasoning process and ready to begin fabricating. Photo's, in the rough, are available. Dining, coffee, end, or conference tables. 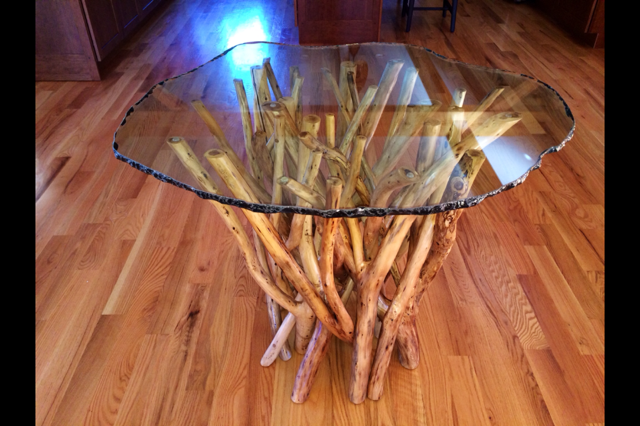 Here are just a few of the root pieces that we have in the rough for this style of table. Click Here. HERE ( click ) is a page with various extraordinary one piece burl slabs you might like to view and would make wonderful tops for these root bases.. If you would like a quote on BURL tops, please refer to " redwood burl ". One option for a table top is this rare burl. View extremely rare, solid and large slabs of burl on these links.